The global roll-to-roll printing market for flexible devices is expected to reach USD 35.79 Billion by 2022 at a CAGR of 11.04% between 2016 and 2022. The growth of this market is driven by factors such as advantages of using flexible devices in the electronics industry, high-speed fabrication using roll-to-roll, and the fast-growing market for flexible screens. The base year considered for the study is 2015 and the forecast is given for the period between 2016 and 2022. The roll-to-roll printing ecosystem includes research and development associations, component suppliers, product manufacturers, assemblers, distributors, and service providers as important elements. The roll-to-roll printing ecosystem comprises major players such as Konica Minolta Inc. (Japan), Sumitomo Electric Industries Inc. (Japan), GSI Technologies LLC (U.S.), 3M Company (U.S.), LG Display Co., Ltd. (South Korea), Thinfilm (Norway), Linxens (France), Multek Corporation (China), E Ink Holdings, Inc. (China), Fujikura Ltd. (Japan), and Nippon Mektron Ltd. (Japan). The global roll-to-roll printing market for flexible devices is expected to grow from USD 16.31 Billion in 2015 to USD 35.79 Billion by 2022 at a CAGR of 11.04% between 2016 and 2022. The market for flexible devices is expected to grow substantially due to factors such as the advantages of using flexible devices in the electronics industry, high speed fabrication using roll-to-roll printing, and the fast growing market for flexible screens. The roll-to-roll printing material market comprises different substrates and inks where the substrate market is again classified into paper, plastic film, metal foil, stainless steel, and glass. Plastic film held the largest market share in 2015. Plastic film substrates are the most widely used substrate material in flexible electronics applications requiring high degree of bendability, transparency, and emissive properties. Owing to certain key benefits offered by thin film plastic substrates (such as flexibility, low temperature requirements and low cost), plastic film substrates are expected to hold a large market share in the near future. Printed RFID tags, sensors, organic photovoltaics, and flexible displays have a good potential and make substantial use of thin film plastics as a substrate, which will drive the plastic substrate market at the highest rate. In 2015, North America led the roll-to-roll printing market for flexible devices, followed by Europe and Asia-Pacific. The U.S. held the largest share of the North American R2R printing market for flexible devices owing to the continuous technological development in the U.S., followed by Canada and Mexico. However the roll-to-roll printing industry faces some challenges associated with the manufacturing technique and performance of the flexible electronics. The high risk of failure and need for mass production acts as one of the restraints in the roll-to-roll printing market for flexible devices growth. This report describes drivers, restraints, opportunities, and challenges pertaining to the roll-to-roll printing market for flexible devices. Furthermore, it analyzes the current scenario and forecasts the market till 2022, including the market segmentation based on material & equipment, technology, application, end-user industry, and geography. 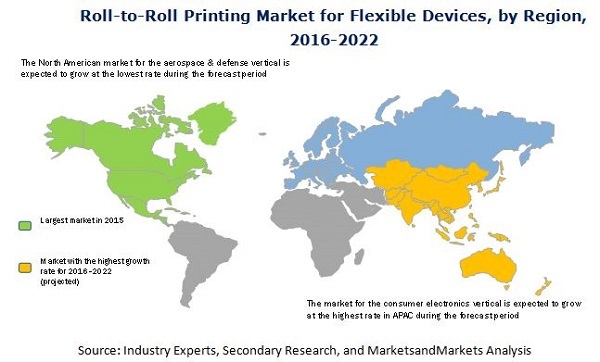 Some of the major companies in the market for flexible devices include Konica Minolta Inc. (Japan), Sumitomo Electric Industries Inc. (Japan), GSI Technologies LLC (U.S.), 3M Company (U.S.), LG Display Co., Ltd. (South Korea), Thinfilm (Norway), Linxens (France), Multek Corporation (China), E Ink Holdings, Inc. (China), Fujikura Ltd. (Japan), and Nippon Mektron Ltd. (Japan). 15.2 LG Display Co., Ltd.
15.3 Sumitomo Electric Industries, Ltd.
15.9 E Ink Holdings Inc.